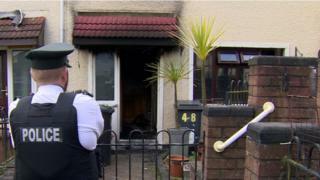 Police are investigating an arson attack at a house in north Belfast on Saturday morning. The Northern Ireland Fire and Rescue Service (NIFRS) received a report of a fire in Silverstream Parade at about 04:40 GMT. Three fire engines attended the property. "We are extremely fortunate that no-one was in the house at the time of this incident," said Det Sgt Corrigan, who also appealed for information. "Whoever carried out this reckless attack showed total disregard for the occupant and other residents in the area. They did not care who could be killed or injured."